Pictured: TrinYDSA members Brooke Williams (’19), Samuel Bryan (’20), Nat Bush (’19) delivering funds and fresh baked cookies (not pictured) to CT Bail Fund co-directors Brett Davidson and Ana María Rivera-Forastieri. Members of the newly formed Young Democratic Socialists of America chapter spent their inaugural semester fundraising for the CT Bail Fund. Through a combination of in-kind donations, proceeds from baked good sales, and profits from purchases from the on-campus thrift store The Coop, students raised a total of $1,000 for the Bail Fund. 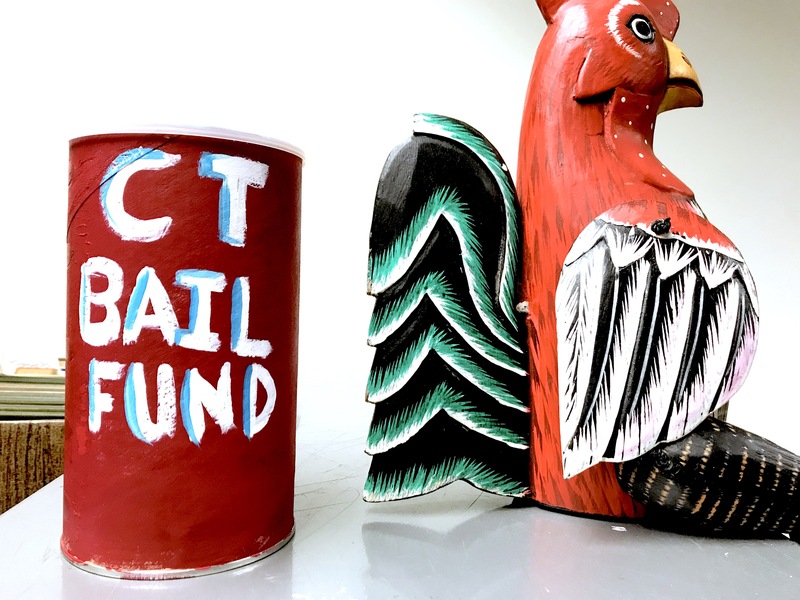 The CT Bail Fund is an organization based in New Haven, whose mission is to free low-income Connecticut residents post bail to avoid pre-trial incarceration. In an informative public talk organized by TrinYDSA in November of last year, CT Bail Fund Co-Director Brett Davidson explained how the existence of cash bail criminalizes poverty and disproportionately affects the most vulnerable Connecticut residents. “Even people who self-identified as being very politically involved and progressive were surprised by what we learned that day,” said event organizer and YDSA co-president Brooke Williams ’19. YDSA members imparted that wisdom to the Trinity community as they walked into Mather hall last semester. YDSA members regularly signed up to bake dozens of batches of cookies and muffins, and then took turns tabling outside of Mather or knocking on professors’ office doors to sell these desserts while simultaneously educating members of the Trinity community on how cash bail criminalizes the poverty of working-class communities of color here in Hartford. “When I was tabling, I learned that most people are really willing to help out and donate once they put faces to issues like mandatory sentencing and excessive bail,” said member Tiara Desire-Brisard ’19 of her experience tabling for the Bail Out Bake Sale. Overall, the Bail Out Bake Sale project was a successful debut for the students of YDSA. Members learned from experienced community organizers in Connecticut while implementing their own massive fundraising project from the ground up. “I learned a lot about how capitalism intersects with the criminal justice system, and I also perfected a recipe for chocolate chip muffins,” summarized YDSA Co-President Tessa Reading ’19. To get involved with YDSA, contact Brooke.Williams@trincoll.edu or Tessa.Reading@trincoll.edu.